For the second game in a row, QB Derek Anderson took a crushing blow that nearly knocked him out of action, as the Falcons steam rolled the Cardinals by a totally lopsided margin. 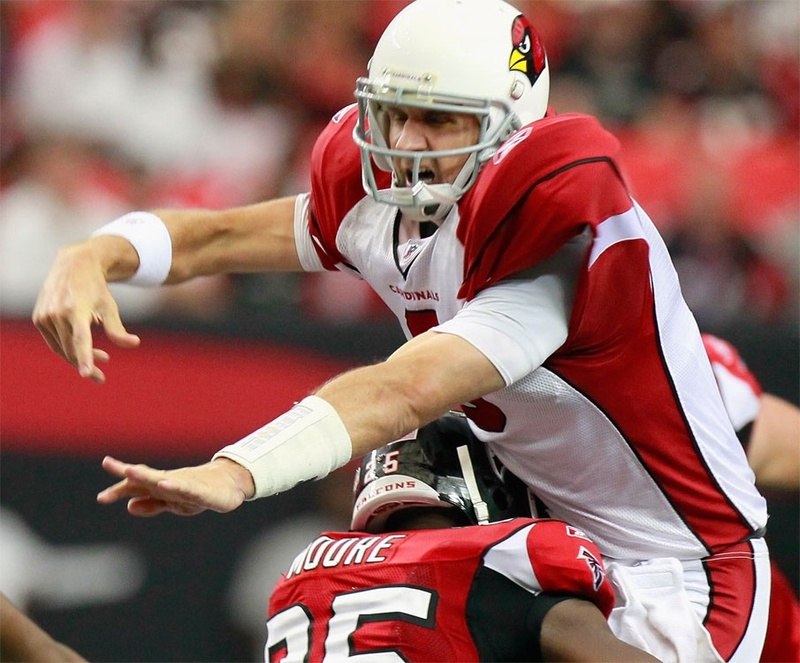 The Atlanta Falcons exacted a bit of revenge on the Cardinals by embarrassing the 2008 Wild Card winners in Week 2. 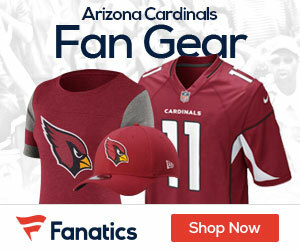 For Cardinals fans, it was one of those games that have become synonymous with Arizona. They crop up once and a while and when things go wrong, they go wrong in every possible way. In the second half, heads hung, flags flew, a player was ejected, and the Cardinals appeared as if they were never serious about winning this game. Aside from last year’s Week 3 blow out at the hands of the Colts, the 2009 Cardinals avoided such a game, but the 2010 Cardinals couldn’t side step this landmine in Atlanta. The Falcons moved the ball with ease, scoring on the first possession via a Matt Ryan 7-yard touchdown pass to Roddy White, putting the Falcons up 7-0 in a flash. On the ensuing kick-off, LaRod Stephens-Howling sprinted 98 yards for a touchdown only to have the score negated by an Arizona holding penalty. The holding penalty was attributed to Darnell Dockett, though he wasn’t on the field, making it unclear who actually committed the infraction. In any event, it was the first of many plays that together summarized the Cardinals’ efforts. Instead of a 7-7 tie, the Cardinals punted the ball back to the Falcons. Atlanta only put up 3 more points in the first quarter, but apparently they were just pacing themselves for the outburst to come. Two minutes into the second quarter, Tim Hightower broke off an 80-yard touchdown run, which cut the Falcons lead to 10-7. The Cardinals, without Beanie Wells for a second straight week, actually got great production out of Hightower considering he gained 111 yards on only 11 carries without fumbling. After the Cardinals’ lone touchdown, though, the Falcons piled up 31 unanswered points and completely dominated the Cardinals on both sides of the ball. Matt Ryan (21/32, 225 yards, 3 TDs, O INTs) passed the ball with ease all over the field. Calais Campbell and Darnell Dockett seemed all but invisible as the Cardinals’ pass rush didn’t threaten Ryan much at all. Only Clark Haggans was able to drop Ryan for one sack, but it was merely a coverage sack as the Cardinals, for once, blanketed the Falcons’ receivers. Quality pass coverage by the Cardinals’ was fleeting and in short supply as Roddy White made Dominique Rodgers-Cromartie look like a rank amateur. White caught seven balls for 78 yards and 1 TD while DRC committed two pass interference penalties and seemed to be trailing in White’s wake the whole game. Kerry Rhodes also had a poor game. The free safety committed a few penalties and was actually ejected from the game when he placed his hand on the referee’s shoulder to protest a penalty (we’ll get back to penalties in a little bit). On a bright note, which were tough to find, Rookie LB Daryl Washington, however, did record his first double digit tackle game of his very young career with 10 solo tackles. In addition, Joey Porter forced a Matt Ryan fumble, which Greg Toler scooped up right before the half ended. Unfortunately, this was the extent of the Cardinals’ good play on defense. A key priority for the Cardinals’ defense was to stop Michael Turner, which, in a way, they did. Turner left the game early with a groin injury, but not before gaining 75 yards on just 9 carries. In addition, backup Jerious Norwood also left the game after an injury on the opening kickoff. Enter Jason Snelling, Atlanta’s third-string running back. Snelling apparently doesn’t fashion himself a third-stringer and for good reason. He had a career day gaining 129 yards on 24 carries with 2 rushing TDs. In addition, Snelling added five catches for 57 yards and a receiving TD. Without their top two running backs, the Falcons’ offense still proved to be too much for the Cardinals’ lack luster defense, which gave up an embarrassing 444 yards of total offense to Atlanta. Besides Hightower’s run, there isn’t much to say about the Cardinals’ offense that isn’t disparaging. Derek Anderson (17/31, 161 yards, 2 INTs) had his first poor outing as a Cardinal, but by no means could you pin this loss on Anderson alone; such an outcome was truly a group effort. The Cardinals were atrocious on third downs, failing to convert on a single one of their eight attempts. They gained a measly 4.3 yards per completion through the air, though Larry Fitzgerald and Derek Anderson improved their play as they hooked up for 83 yards on 7 completions. Although the Cardinals gained 9.1 yards per rushing attempt, they were only able to run 13 times since the game got out of hand so quickly. Unfortunately, the Cardinals are still a predictable offense, which wasn’t a problem when Arizona had the high-powered passing attack that is now glaringly absent. Atlanta constantly stacked eight men in the box while the game was in question, but the Cardinals lacked the offensive prowess to take advantage of their unbalance. Instead, the Cardinals, for lack of a viable alternative, continued to play into the teeth of Atlanta’s defense as Derek Anderson was pummeled again and again by the Falcons unstoppable pressure. Atlanta teed off on Anderson almost at will, which sooner or later will get Anderson injured. As previously mentioned, the Cardinals are no strangers to blow outs. Darren Urban of the Cardinals’ official website pointed out the Thanksgiving Day massacre in Philadelphia and the blizzard nightmare in Foxboro, both in 2008. The Cardinals’ “wake up call”, therefore, isn’t an altogether unfamiliar occurrence, a fact upon which Darnell Dockett reflected. “We will bounce back,” Dockett said. “I know what kind of team we have, I know our coaches. We will be even more strict on people now because we are not where we want to be. This is a humbling situation for us.” Quite humbling. There were many things that were frustrating about this loss. First and foremost, perhaps, there’s the ludicrous amount of penalties committed by the Cardinals; 10 for 109 total yards, one of which negated a touchdown. A few calls, though, were questionable at best. The phantom holding penalty on Stephens-Howling’s kickoff return and Bryan Robinson’s face mask penalty (though his hand never touched the front of Ryan’s helmet) both come to mind. Despite such calls, which are a part of every game, the Cardinals did far more than enough to lose. “We can’t blame everything on the penalties,” Fitzgerald remarked after the game. In addition, Arizona gave the referees’ every reason to keep their hands on their flags. A team that actually commits a high number penalties is not going to get the benefit of the doubt from the officials. It shouldn’t happen, but it’s human nature and the natural consequence of playing sloppy, undisciplined football. Besides the penalty issue, the Cardinals playcalling and clock management before the half was especially vexing. The Cardinals received the ball with 3:24 seconds in the half, trailing by 17 points. Arizona ran only two plays in 1:24 seconds; a meaningless 4 yard run up the middle by Hightower and an 8 yard pass to Stephens-Howling. Instead of utilizing the two minute warning, the Cardinals failed to get a play off at the line. After the break, the Cardinals gained 27 yards, bringing the ball to the Atlanta’s 36 yard-line. Whisenhunt, for some reason, elected to throw twice when faced with a 2nd and 3, and a 3rd and 3, failing on both attempts. Instead of going for it with 43 seconds and one timeout left, Whisenhunt sent out Feely for a 54-yard attempt to possibly add 3 relatively meaningless points from an extremely challenging distance. Feely missed and the Cardinals accomplished absolutely nothing. Arizona, the team that would receive the ball to start the second half, had 3:24 seconds to pull within 10 points of the Falcons in a game that was rapidly getting out of control and they came up with 0 points and even managed to give the Falcons the ball back before the half. The Cardinals squandered their only opportunity to climb back into the game; ineptitude of the highest order. Despite the crushing effect a loss like this may have on the Cardinals for a few days, the long-term effect shouldn’t be drastic. Atlanta is a good team and although you always want to stay competitive, this loss is just a matter of degree. Arizona had a tough assignment with two road games to start the season. A split was really the best case scenario and that’s what the Cardinals achieved. Things should look brighter when the Oakland Raiders head to Arizona for the Cardinals’ home opener. Unfortunately, you are getting a preview of the DA show. We saw it for a few years in Cleveland — which isn’t doing much better this year. Strong arm, but no sense of touch. Lasers into the ground at short receivers while missing defensive reads. I wanted DA to do well as I really liked the person, but you are in for a long season with him at the helm. Good luck. Well, I hope you’re wrong, but there’s definitely cause for concern. Things should get better for at least one week when the Raiders come to Arizona.